Accountability is a key ingredient of success. But we avoid it because it makes us uncomfortable. It takes guts and humility to be held accountable but the results are so amazing that it’s worth it! We’ve all been held accountable for our words and deeds by our parents when we were younger. Our parents may have been kind or they may have been tyrannical but it’s the disciplines we created that made us better. Unfortunately, some parents never hold their children accountable. That is failing as a parent. Let’s look at its effect on adults in the workplace. There it’s your boss or co-workers who hold you accountable for the good of the organization. The boss has historically been the one who holds people accountable at work, but joint accountability is much better if you can do it. Team members must CHOOSE to be held accountable for this to work well. When teams choose to be held accountable by each other, it respects everyone and creates better teamwork. Accountability works because people are creatures of habit. And some of their habits work against their own goals they care very much about!! Some of their habits work against the goals of the organization. At our house we take turns cleaning the kitchen. Tuesdays are my night. 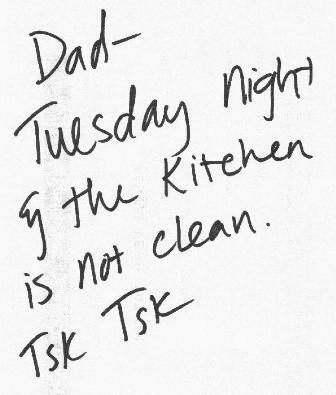 As you can see by the above note, my 21-year-old daughter (who still lives at home) held me accountable for my failing the team last week. At first I was resentful because I do a lot more housework than she does. But then I realized the humble and team oriented thing to do was to choose to be accountable for not cleaning the kitchen. And I suffered the consequences we had previously agreed on for this infraction. Why does joint accountability work? Because we would all rather be accountable to each other than be accountable to the boss. Years ago, I was my daughter’s boss. Now we are team members; sort of. In my career I have had many bosses who held me accountable but I usually held a little bit of resentment for it. I felt “bossed around”. Only one former boss created a culture of joint accountability. His team was very good at holding each other accountable for what needed to be done. That was very empowering and produced better results than he could have gotten the old way. I’ve seen joint accountability work in sports teams too. Those teams are usually very successful. So, how does a leader create this? 1. The first step is to create trust in the team. People are reluctant to choose accountability if they don’t trust. And trust isn’t on or off. There are varying degrees of trust and you need to create as much as possible. 2. The next step is to ask for commitments. If the boss makes the commitment for his direct reports that is much weaker than if the team members commit themselves. 3. Finally, ask team to hold each other accountable and set the example by being accountable yourself. Since this takes considerable courage, it may not happen immediately or smoothly. Keep at it! This is a great goal to work towards, however and very doable. In fact, it might be the greatest thing you can do for your team for their sake, for the organization, and for society as a whole. Now if you’ll excuse me, it’s Tuesday night and I have a kitchen to clean.